A Lot of People Are Getting Hurt on Scooters—so Who's to Blame? Home Transportation A Lot of People Are Getting Hurt on Scooters—so Who’s to Blame? Over the past year and a half, Lerer says the law firm she runs with her husband, Daniel McGee, has received between 200 and 300 calls about scooter-related accidents, some of which have resulted in gnarly injuries. The firm’s website features a gruesome gallery of fractured bones, road-skin, broken teeth, and extremities forced into unnatural positions (fair warning: they’re really gross). 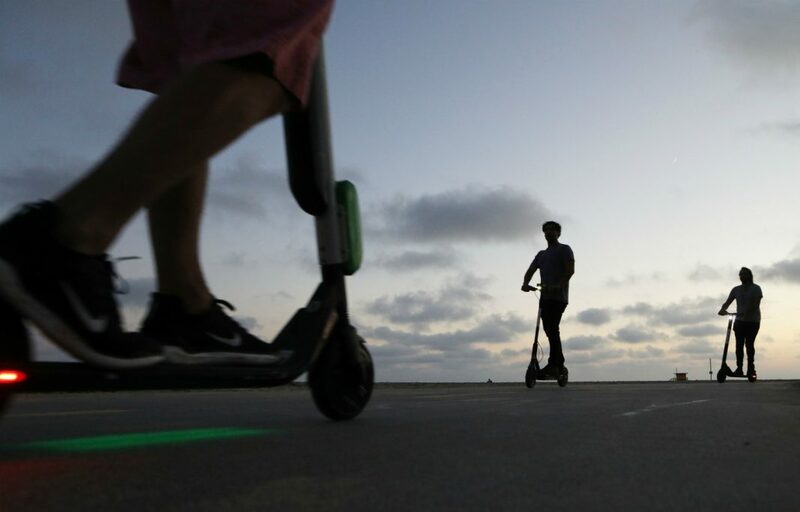 As vocal opponents of scooter apps Bird and Lime, the couple has made the rounds in local media, railing against collapsed handlebars, faulty brakes, and other malfunctioning equipment. In their opinion, scooter companies should be held accountable for the string of crashes. “I lay the fault on these companies, who I think are not maintaining these scooters,” says Lerer. “They’re defectively designed.” In October, the firm filed a class-action lawsuit accusing several companies of “gross negligence” and “abetting assault,” and Lerer says they’re working on 40 to 50 individual cases as well. Other L.A. law firms have also started pursuing scooter suits, but winning them isn’t easy—most companies’ user agreements require riders to waive liability before they hop aboard. “They say in the agreement that you assume responsibility for any injury or damage caused by use of the scooter,” says Lerer. There is some uncertainty, however, about what’s really causing these riders to get hurt. While there isn’t a substantial body of scooter research yet, a small study published this year in the medical journal JAMA Network Open says that scooter injuries have been outpacing bike and pedestrian injuries at two Westside L.A. hospitals but doesn’t make any mention of equipment malfunctions. Eighty percent of 249 scooter-related emergency-room visits happened because the rider simply fell off, while an additional 11 percent of riders collided with objects, and nearly 9 percent were hit by a moving vehicle or object. The study also notes that more than 95 percent of these riders weren’t wearing helmets, which was illegal in California before this year. Some urbanists argue that it’s L.A.’s street design—which notoriously prioritizes cars over bikes and scooters—that poses the real threat to scooter users. “Scooters may be malfunctioning, but it seems to me that the crux of the problem is this competition for very limited space by very different transportation modes,” says Anastasia Loukaitou-Sideris, a professor of urban planning at UCLA. In her opinion, keeping riders safe means creating better rules surrounding speed and helmet usage, and carving out more space for riders in the streets. “We really need to find space, and regulate them,” she says.